Output has established itself as one of the top companies to go to when looking for forward-thinking and high-quality tools for music production. Their array of instruments are as unique as they are beautiful sounding. Most recently they introduced a plugin called Arcade to their lineup which is a loop synthesizer connected to the cloud. What does that mean exactly? It means that the instrument is one part sampler, one part loop library, and one part effects unit that gets updated with new samples every single day. If that doesn’t immediately short-circuit your brain while considering the possibilities then let us dive deeper as we review the plugin below. There’s so much you can do with this plugin that we’ll break it down to the basics and dive into the more advanced features within, you’ll be able to follow along and then test it out for yourself because Output gives you a 100 day free trial! 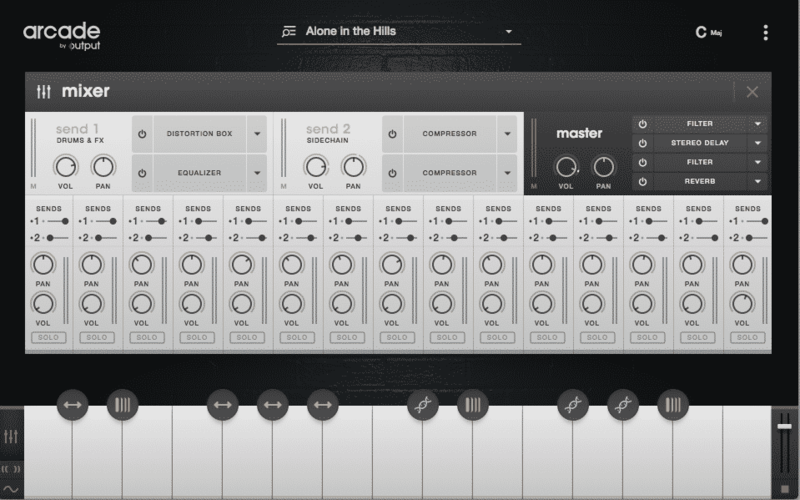 The instrument can be split up into two functionally different sections – the browser, and the synth. The browser is where you can select all the different content Output makes available to you. You can select samples via three paths – Product Lines, Kits, or Loops – product lines being the ever-growing selection of loops grouped together by similar sounds (Toys, Instead of HiHats, Modular Circuitry, etc. ); Kits are collections of 15 loops already mapped out with modifiers, macros, effects, and modulation; Loops are all the individual loops searchable by tags and search bar. Like we said before, new content is being added to Arcade’s library every single day, so that means lots to choose from. This is where the connection to the cloud comes in handy as you can preview all the sounds before downloading and you only need to download the stuff you like. Previewing and downloading is as easy as clicking the buttons on the right of each loop you want. In Arcade you can save any changes you’ve made to kits and can find those in the User Kits section. In User Loops you can find all the loops you’ve imported into the plugin which is as simple as dragging a file onto any of the white keys! Now for the actual instrument – Arcade is both a loop sampler and an effects unit in one. You can trigger loops from the white keys and affect them with modifiers using the black keys. You can play up to 15 voices at once which means 15 keys which then means you could be playing 15 different loops at the same time. If you wanted to you could essentially lay out the parts for an entire song and play them within Arcade. If you want to build custom kits it’s as simple as dragging your loops of choice onto white keys. For affecting your loops, there are three types of modifiers available – Resequencer, Repeater, and Playhead. You can dive into each modifier and tweak how exactly you want it to affect loops when triggered, we’ll leave that to you. If you’re looking to shape the tone of your loops you can assign any parameter in Arcade to one of the four available macro sliders. Each of the sliders is MIDI-assignable for external control. A convenient option for the plugin is that all loops can adjust to your session tempo and key. The tempo will match automatically but make sure to specify the session’s song key within Arcade and click the lock beneath the key options. Lastly, there are the Modulation and Mixer pages. On the Modulation page, you have the option of assigning and adjusting two modules both of which can be switched to either an LFO or a step sequencer. The step sequencer can be set between 1 and 32 steps. This is simply beautiful. Having this option gives you the ability to really spice up your already fuego sounds. You could have subtle touches of modulation just to add some character into your loops or really mangle the original sources. We fiddled around with the plugin for a bit to understand the interface and how it could improve the songwriting/production process, it essentially made the game TOO easy. If you want something with high-quality loops that are organized into unique soundscapes then Arcade is for you. If you want an instrument that doesn’t abide by the rules of your typical synth, then Arcade is for you. It comes with 15 internal effects and a library of loops that grows EVERY SINGLE DAY. Watch the walkthrough video below to see the plugin in action, then go over to the Output website and download the plugin for the 100-day free trial. But if you’re already convinced then stop waiting and buy the thing, it’s amazing. 0 responses on "Arcade - A Loop Synthesizer by Output"